Yesterday morning I made a short trip to the James P. Kelleher Rose Garden, near Fenway Park in Boston. It's another rose garden only 15 minutes away from my home that provides me with lots of photographic objects in the early summer. I also like that the park's name plates identification for each rose. The rose garden was mostly in full bloom although some had already passed. Lots of people at the time but I blended in perfectly with the photographing crowd that was present. 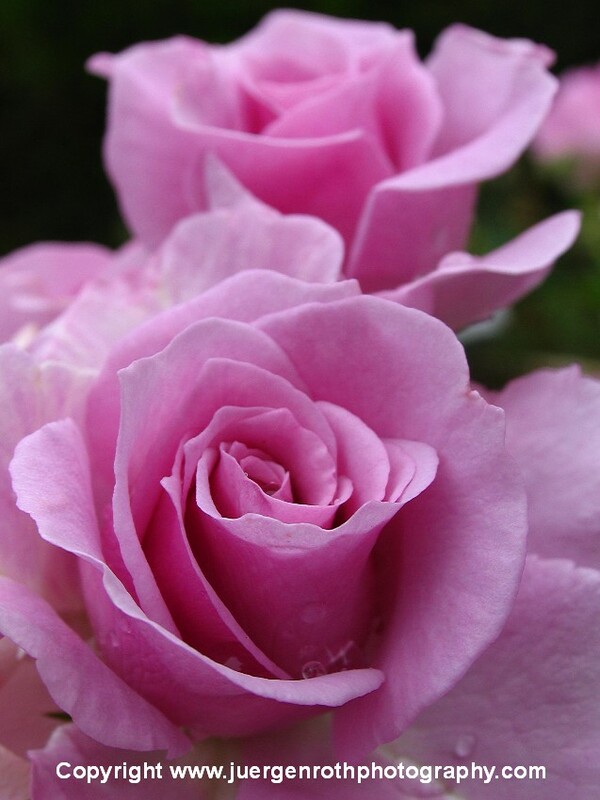 I was looking for a magenta rose to add to my fine art rose collection and succeeded finding an attractive couple that were still in beautiful bloom. I arranged my tripod and first focused on the magenta rose in the foreground. After taking a few shots I zoomed out and re-composed the image to include the second rose in the background. The focus point in Double Take was on the petals where they spiral together. Using the camera self timer I captured a series of three images with different exposures settings. The at 1/3 step underexposed capture worked best. and the aperture was set to f5.6 resulting in a shutter speed of 1/400 second. During the digital post processing steps I applied minor adjustments to contrast, saturation and sharpness. Very nice. I can say you have some skill in photography. How I'd wish that I could take photos just like professional photographers. I have a garden of roses as well, but as much as I like to have them photographed, I can't because I don't know how to. I tried before but still it doesn't have that dramatic feel in it. Anyway, thanks for serving as an inspiration.